Ah, cucumber melon... Simply smelling the aroma of these sweet scented bath salts perks you up! It’s like walking into a candy store! Needless to say, kids and adults alike love the scent. Enjoy our Cucumber Melon Bath Salts in the bath or use them in the shower (see usage suggestions below). 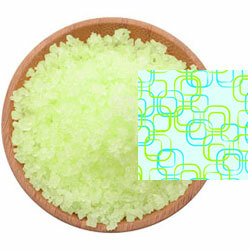 A fine/medium grain blend of Pacific Sea Salt with the sweet scent of cucumbers and melons in a lime color.